This morning, Synta told me that I was tagged on her new post of her new blog. She said she’d blog back, and it brought me to a couple of years ago. I’ve known Synta her since we were in high school, through (guess what…) blog. In 2006, she got into Art & Design Faculty in ITB and a year later, I got into the Earth Science & Technology Faculty of the same university. We’ve never been really friends that hang out together or so on; but she’s more like an old friend. I somehow remember her ex and some scenes of her high school years she told in her old blog :)) And yes, I watched her on stage with her band some times in university. So that was about Synta. This is actually my 10th year of blogging and it’s always very nice to look back and remember people I’ve met along the journey. I think I would write more about my ten years of blogging under a tag; #2002to2012. 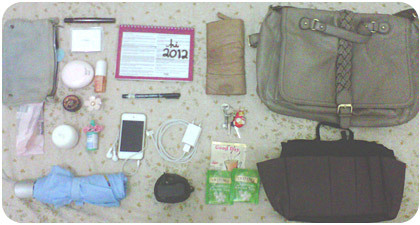 So here’s my bag & what’s inside. The bag. It’s actually one of the bags that I’m currently using, a standard H&M bag I stumbled upon in Osaka. Yes, I’m a bag-lady type so I use a bag organizer (bottom right) to put everything and everytime I feel like using another bag, I just replace the bag organizer. What’s inside. You can judge what’s inside from outside. 1) IKEA Denim pouch containing plastic comb, The Body Shop lip butter & cleansing wipes, The Face Shop powder & lip tint (hardly even used though), eye drops for contact lens, daily sunblock, spare hair rubber band, and 2 eau de toilettes, Daisy by Marc Jacobs & chocolate toffee Spray of Sephora. 2) iPod touch 32 GB, and its charger (optional). 3) BlackBerry (Curve if you wonder), and its charger. 4) Monthly planner agenda and a drawing pen. Yes, I still write my plans and schedule with pen on paper. And yes, I doodle on it pretty much. 5) Wallet (from Topshop). Cash money, coins, ID cards, debit & credit cards, health insurance card, member cards of some health & beauty shops. What do you expect? Pictures of a guy? Yes, a lot of them, especially Kapitan Pattimura & Pangeran Antasari. 6) Umbrella. Essential for a girl who relies on public transportation. 8) Green tea and instant coffee. Yes, I bring them almost everywhere, especially to the office. Twinings or Tong Tji, Good Day or Nescafe. For going to office, I sometimes I also pack a plastic lunch box for breakfast and a bottle of mineral water.